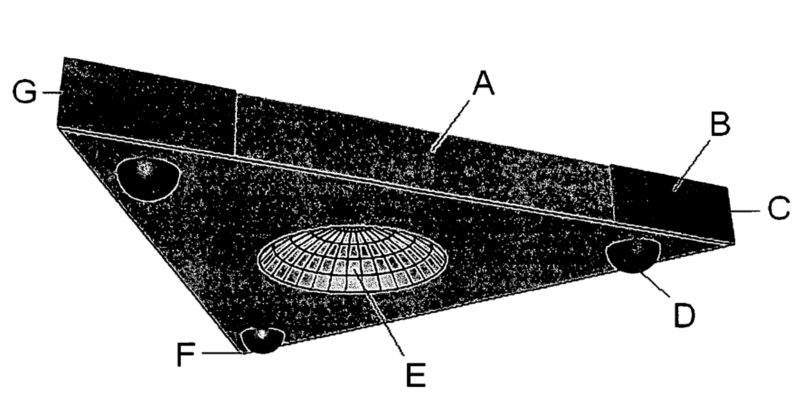 UFO websites and various “researches” are very excited about a US patent 20060145019 A1 “Triangular spacecraft“. They all seem to think that TR-3B Flying Triangle patent is now in the public domain. Have you seen people using this remote viewing amplifier? How about people teleporting around? Clearly these patented things do not work or exist. The problem with this photo: it is a fake. It turned out to be a panel of painted styrofoam with three embedded flashlights. It is interesting that the only photographic evidence of the Belgian UFO wave was a hoax. 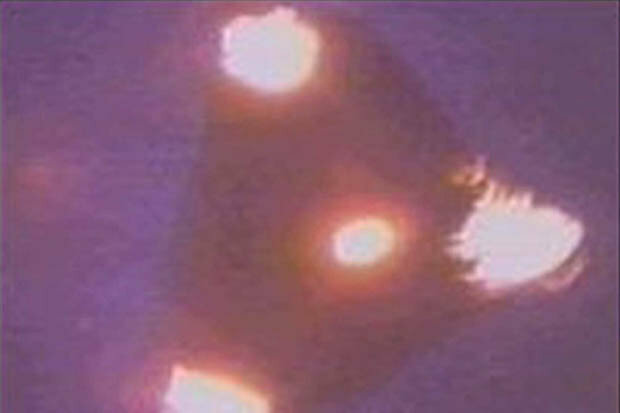 UFO researchers and believers often talk about the Phoenix Lights from 1997 as concrete evidence of triangular shaped UFOs (or TR-3Bs). Some call it the number one UFO sighting of all time. What people actually witnessed? A group of military aircraft and flares. However, this story just won’t go away even when it has been explained many times. Enjoying your site. Where is the evidence and what is your source on this statement? Did you look at the actual eyewitness statements in reaching your conclusion about the Phoenix Lights? Hey Xeno, many thanks for your comments and questions! About the Belgian “TR3B”. Prior to this confession (RTL Belgium. 2011) http://www.rtl.be/info/belgique/faits-divers/le-mystere-du-celebre-ovni-des-annees-90-elucide-une-supercherie–240323.aspx there was already a lot of research done suggesting the sighting was a hoax. E.g. Roger Pacquay’s photo analysis was good. None of this will have impact on true believers, though. About the Phoenix Lights. I have seen some documentaries including eyewitness statements concerning the 1997 event. I agree with Tony Ortega’s views on eSkeptic (linked in the post). He is not the only scientist who has come to similar conclusions. In many cases UFO eyewitnesses have been interviewed by ufologists. The interviewer might not be trained to interview eyewitnesses and victims. In these cases the eyewitness statements should be basically dismissed. I’m neither a true believer nor a true disbeliever. The evidence wins. So for the Petit-Rechain “TR3B” photo there’s a guy known only as Patrick who confessed that he made a model. Is there some compelling detail in the anonymous confession? I’ll check out what Patrick said, as well as Pacquay’s analysis, thanks much. For the Phoenix lights, I read over a hundred witness statements, and the “people are just confused” view just doesn’t do it for me. Too many reliable people over a huge area reported that they saw the same things, multiple huge silent dark shapes with lights. A group of people sitting around a table outside, for example, will not, in my view, due to emotions and confirmation bias, mistake flares, helicopters or jets in the distance for a huge dark shape that floats directly overhead blotting out the stars. Nor is the military in the habit of firing what would seem to have to be some exotic kind of extremely long lasting smokeless flares over the airspace of multiple civilian airports. I still don’t know what they were. Do you think it is true that 700 witnesses were interviewed by a city council woman who was not a ufologist? Nice to meet you and I will enjoy checking out more of your work. Link says: Photo was originally taken on April 4, 1990. Patrick’s confession was 18 years later, made to Samuel Ledoux. Patrick said he made it quickly when he was 20 years old as a joke for co-workers. A panel frigolite translates to a flat piece of Styrofoam, which one could make into all sorts of nifty UFO shapes. Hmm. Or the guy who confessed was Samuel Patrick Ledoux… French. This is a fun one to track. Video confession on RTL, Belgian TV was some time before July 26, 2011 1:16 p.m. Looking for link. Here’s the confession. Seems believable enough even without understanding the language. It is not clear if the so called Town Hall meeting (possibly involving the Discovery Channel) actually took place. Wikipedians did leave the chapter about the meeting after a debate, but they could not identify any source. So I don’t know. It is true that many people saw the same thing – most of them saw the second event. It is not surprising that there are many witness accounts describing the similar event. It is the most widely witnessed “UFO” event. Some of the witness statements contradicted the photographic and video evidence, though. Jannefi You are one ignorant fool. I was IN PHOENIX ARIZONA, when these ” lights ” or Government craft . The entire CITY saw them. These WERE NOT FLARES. It was a SOLID OBJECT Slowly hovering over the sky, bigger than the Bank One Building. No Military aircraft nor any plane was flying over in the same area, this object was also slowly moving. It was a Solid Object. I dont know what game you’re playing or what you’re getting out of this, but you don’t have a damned clue what you’re talking about. You trying to to dictate what we all saw and didnt see, is laughable. I’m not trying to dictate what you saw or didn’t. I expressed my opinion of the Phoenix lights based on research such as this https://www.skeptic.com/eskeptic/08-05-21/ Many researchers have come to the same conclusion. Evidence suggests they are right.